Craig Ferguson and his wife, Megan, are the hosts of a new YouTube series sponsored by Gant. How can you spot a psychopath? When do we have to leave Earth? Can real food feed the world? Can we stop aging? Is happiness an addiction? At some point, we’ve all asked ourselves and the people we know at least one of these questions. Maybe it was asked in earnest, or maybe we were being a little more sardonic. But regardless of the intention, there are people on this planet trying to answer life’s biggest questions. In a new series, former Late Late Show host Craig Ferguson and his wife, Megan Ferguson, are hoping to make viewers more curious about the world they live in, compelling them to skip the shallow talk and go deep. 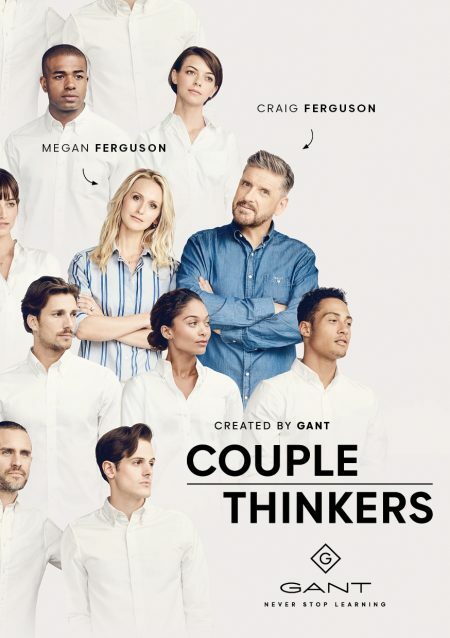 However, Couple Thinkers isn’t on a traditional network—it’s a YouTube series co-produced by Gant, the American clothing brand headquartered in Sweden. The six-part series, which debuts on Oct. 9, features the couple interviewing a handful of celebrity experts. In one episode, they travel to a garden in the Los Angeles neighborhood of Watts to talk with entrepreneur and philanthropist Kimbal Musk about the future of food. In another, they hang out in a planetarium discussing interstellar issues with astrophysicist Neil deGrasse Tyson. Other episodes feature media mogul Arianna Huffington, the journalist Jon Ronson and molecular scientist Daisy Robinton. When Gant initially approached Ferguson about doing a show, he declined because he didn’t know where they were going with it. He said he didn’t want to do a commercial. But when they said all he had to do was wear Gant clothing, he started listening. Couple Thinkers is by no means a small investment for Gant. In fact, the campaign—which has been in the works for one and a half years—is the biggest the brand has ever done. According to chief marketing officer Eleonore Säll, the goal is to market the series not as it would a normal commercial for a clothing brand, but instead how a movie or television studio would market a new show. She said the company has consulted studios about their past strategies, and on Oct. 2 it plans to push out 150 assets in 70 markets, with 80 percent digital and 20 percent traditional spend. While Gant would of course like to help raise the profile of the brand—whose tagline is “never stop learning”— Säll said the brands that survive in the future will be the ones that share values with consumers. If they can become associated with curiosity, that’s a good thing. 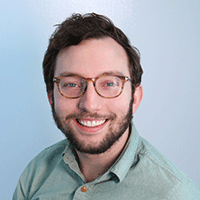 In a way, the process is similar to how Ferguson has handled guests in the past. He said publicists during his tenure on the Late Late Show would always ask him to watch a celebrity’s new movie before they were on the show. But he’d always refuse, explaining that nobody would want to watch a conversation between two people talking about something only the two of them have seen. He said there’s no shame in being curious and or not knowing something. With each episode, the goal wasn’t to push a perspective, but instead to ask more questions that spark the viewer’s curiosity. However, Ferguson said his own perspective shifted during the episode about genetic engineering. He said he went into it thinking about the potential of curing diseases but left with bigger questions about the ethics of the science. Will there be a second season? The Fergusons said they hope so. In fact, they said they think it could be the future of media even beyond what branded content already is today. Plus, Craig Ferguson said the levels of bureaucracy with Gant were “far, far far less” than when he deals with broadcast networks.